Matrutva Shishu Swacha Sansthan and Various offices of District Health Services of Bijapur District. There are total 102 contract positions going to recruit through walk in interview. Out of 50 posts 00 posts for RHO MPW and 50 Staff Nurse Jobs. Interested and educational qualifications having Bijapur District Local candidates can attend the walk in interview on 25-07-2018. 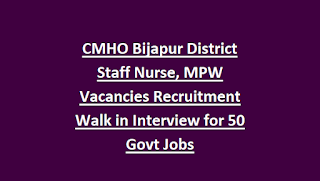 For more details regarding Bijapur District CMHO Staff Nurse, MPW educational qualifications, available vacancy details and more is given below. 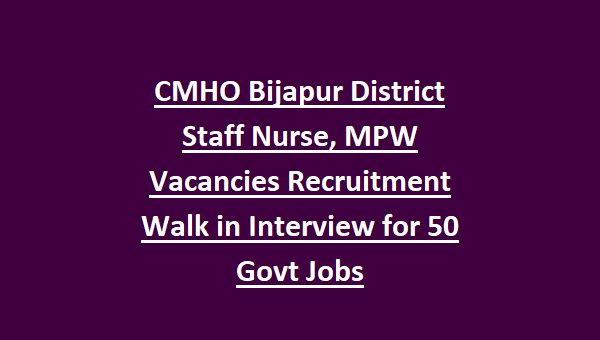 There are total 50 Staff Nurse and MPW jobs in Bijapur District Office of the Chief Medical Health Officer. For Staff Nurse-Candidate should have qualified B.Sc Nursing or GNM Course and Must have registered with Chhattisgarh Nursing Council. For MPW-10+2 in Biology and MPW Diploma Course and CG Live Registration with Paramedical Council. Candidates will be selected based on their marks in qualifying exam and their performance in walk in interview. These vacancies are purely contract basis for 89 days. Interested candidates may attend the walk in interview on given dates along with all necessary documents at CMHO office of Bijapur District. For more details about Bijapur District Recruitment refer the official website @cg.gov.in/bijapur.